Samsung Electronics is developing two types of foldable Smartphones that are totally different from each other, and this development will be part of its ‘two-track strategy’. Samsung Electronics is developing ‘dual-screen’ Smartphone that use flat display on each side and foldable Smartphone that bends single flexible OLED display. It is predicted that Samsung Electronics is going to examine responses from markets after releasing its dual-screen Smartphone first and introduce its foldable Smartphone after clearly showing people how to use foldable Smartphones. According to an industry on the 7th, Samsung Electronics is currently preparing two versions of foldable Smartphones. It is heard that it will produce small amount of dual-screen Smartphones first in 2017 and examine responses from markets. Dual-screen Smartphone that Samsung Electronics is preparing is similar to a product that JDI (Japan Display Inc.) introduced recently as part of ‘Project Valley’ project. This type of Smartphone does not bend a panel itself but has a hinge in the middle and has flat display on each side. Because it does not have separate display when it is folded, it is more like a tablet rather than a Smartphone. A reason why Samsung Electronics is releasing dual-screen Smartphone first is because it wants to examine responses from Smartphone markets. Although Samsung Electronics released curved Smartphone called ‘Galaxy Round’ that has the left and right side bent in 2013, it only produced small amount of it. Afterwards it released ‘Galaxy Note Edge’ that has a edge display, which has one of the sides bent, in 2014. Industries believed that Samsung Electronics wanted to feel out early responses from users regarding curved functions and related functions through Galaxy Round. It is believed that dual-screen Smartphone that Samsung Electronics is preparing will play a similar role as Galaxy Round in order to eliminate any unfamiliarity regarding foldable Smartphones and increase level of awareness on its usage that can cover both Smartphones and tablets. 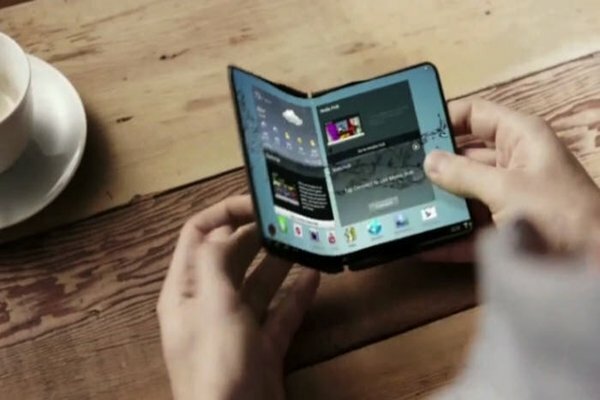 Foldable Smartphone that Samsung Electronics is going to release after its dual-screen Smartphone is a product with innovated hardware that Samsung Electronics is preparing ambitiously. Because its panel itself can be bent, it can be truly called a foldable Smartphone. Samsung Electronics once introduced a video on a foldable product that can be used as a Smartphone and a tablet in 2014. Although this video showed an ‘in-foldable’ Smartphone that has a foldable panel inside of a Smartphone, a product that is being developed will be an ‘out-foldable’ Smartphone that is bent outwardly. “In-foldable Smartphone is seen as a first type of a foldable Smartphone.” said an expert in this industry. “Out-foldable Smartphone is the next step of in-foldable Smartphone.” This indicates that Samsung Electronics already secured a technology that can develop in-foldable Smarphones and has also secured a technology that can develop out-foldable Smartphones. When an out-foldable Smartphone is folded, OLED panels are placed in the front and the back. Panels also work at the part where it is bent, and this Smartphone can be used as a tablet when it is not folded. Foldable Smartphone that LENOVO introduced in August is also an out-foldable Smartphone. Samsung Electronics is however thinking deeply about timing to introduce its foldable Smartphones. It is understood that its foldable display technology has reached certain level. However Samsung Electronics is focusing all of its capabilities into verifying quality of its foldable Smartphones as Galaxy Note 7s were recalled due to its quality. Samsung Electronics’ competitors are also working rapidly on development of foldable Smartphones. China’s LENOVO and OPPO and Japan’s JDI introduced a prototype of a foldable Smartphone and a dual-screen Smartphone respectively. It is heard that Taiwan’s AUO supplied panels to LENOVO for its foldable Smartphones.